A large collection of approx. 80 items, including CDVs, letters, covers, and papers that document the service and activities of Dr. John M. McCalla, Jr., while detailing his contract with the US Army. Born in Lexington, KY, John Moore McCalla, Jr. (1832-1897) moved with his family to Washington, DC in 1845 when his father, General John McCalla (Sr.), a hero of the War of 1812, received a government appointment as second auditor of the US Treasury by President Polk. After completing school, he attended Columbian College and National Medical College, graduating with a degree in Medicine. In June 1860 Dr. McCalla was given a temporary position as Special Agent for the US Government on the Star of the Union on an American Colonization Society trip to Liberia to take a group of Africans to Liberia. The Star carried 383 persons from the slave ship Bogota. The government promised that the return voyage would be nothing like the trip to the Americas. They were to have large ships, a set of new clothes, good, well-cooked food, medical care, sleeping berths, bathing facilities, and protection from the weather. One of McCalla's tasks was to see that the government's end of the "bargain" was upheld. As it turned out, conditions were still problematic, but it was likely out of McCalla's control. The Star of the Union was one of three ships making the return, with 1138 people total. Of those, only 823 survived, most from illness, and many because they had never recovered from the first ocean voyage. Over 100 were reported to have been ill when they boarded the ships. He kept a journal (not present) of his only sea voyage, from which he returned in the autumn of 1860. He turned to the practice of medicine, and in 1863 signed a contract with the Army as Acting Assistant Surgeon (for $100 per month in Washington, $113 if in the field), a position he held at least into November of 1865. The last document in this group is dated November 2, with many soldiers still too ill or damaged to return home. In 1864, he married Helen Varnum Hill. They would have five children, only of two of which survived infancy. After his service with the Army, McCalla returned to his medical practice, but within just a few years he gave it up because of poor health. He took over management of the Varnum family's real estate holdings in the District of Columbia. Dr. McCalla died in 1897 at 65 years of age. 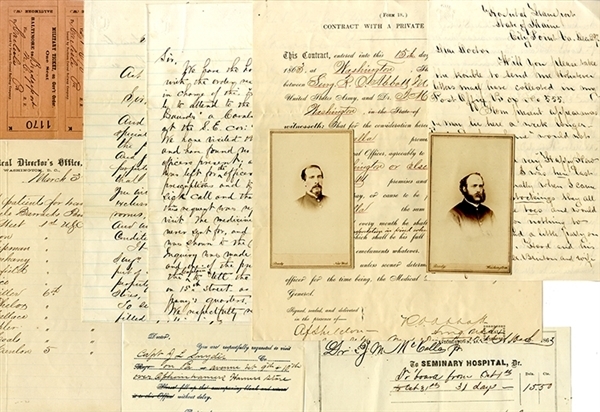 The first item in the archive is McCalla's contract as a private physician with the US Army, dated September 15, 1863, signed by Medical Director of the Army, Robert Osborne Abbott and John Moore McCalla, Jr. Another order dated September 15, 1863 sends him to the Seminary Hospital in Georgetown, DC, to report to Henry W. Ducachet. Two items are letters with accompanying CDVs. One from William H. Finn, asks McCalla to send him any mail that has accumulated in his Post Office Box and relates the small gathering they had for the holidays. He writes from a Hospital Transport near City Point, which suggests that he may be another contract physician. Like McCalla, he is not listed in the Civil War Database. The other is from a patient, Cornelius McLean, lieutenant, 39th NY Volunteers, thanking Dr. McCalla for his care. There are several other "Thank you" letters without photos - E. Greenough, N. Willard, L. Blois. The archive contains numerous instructions for patient pickups, for example, a note on Medical Director's Office letterhead, January 4, 1865: "Sir: You are directed to take charge of Seven (7) patients that will arrive at the Baltimore and Ohio Railroad Depot this City at 5 1/2 o'clock A.M. 6th inst. and accompany them to Carlisle Barracks, Penna. On your arrival at that place you will report to the Commanding Officer of the Post, and when the patients have been provided for will return, with nurses, and report in person to this office." Most of these are signed R.O. Abbott (Surgeon US Army), but a few are signed by other surgeons, such as Johnson Van Dyck Middleton, Andrew Flint Sheldon, and Elisha Griswold. Several payment receipts for expenses incurred during some of these trips are included, as well as receipts for personal items such as a uniform (October 8) and drawers and undershirts. In addition to the orders to pick up patients, lists of those patients for Dr. McCalla to pick up are also included. One noteworthy form is from the "Office Surgeon attending Sick & Wounded Volunteer Officers" with instructions on who the doctor is to visit and their address in Washington. Another order dated July 21, 1865 puts Dr. McCalla in charge of Wards 1, 2, 11, and 12 at Stanton General Hospital in Washington, relieving Acting Assistant Surgeon Cyrus Powers. Signed by Benjamin Buck Wilson (Surgeon US Vols). In April, 1864, McCalla was granted a leave of absence for 10 days to go to New York for private business. He applied for another leave in March 1865 and August 15, 1865, but the latter two were for just a few days. Additional documents include: a mourning bordered envelope and note requesting that Dr. McCalla be a pallbearer for Dr. B.J. Heller; several blank forms, such as Sanitary Commission supply orders, Record of Treatment and Diet, Order for Stimulants (for the most part the choices were alcohol - whiskey, sherry wine, porter, milk punch and brandy), Account of Private Physician under Contract, Requisition for Fuel, and another alcohol order form (Ale, Brandy, Whisky, Wine and Rum). Expected wear and condition throughout with several letters with fold separations, else VG to fine.